Chillers this system, which indirectly cooling a building or process. They are typically used in large systems and cooling distributed with water or a water / antifreeze mixture, when it is necessary to work at low temperatures. Refrigerators, mainly factory units, which are designed for cooling of liquid such as water or, if lower temperature is desired, liquids with low freezing scores. Chillers can be air cooled, i.e. where the capacitor directly cooled by air or water cooling, where the condenser is cooled by circulating water (possibly with the freeze depression if the climate is such that the water would risk of freezing in the winter). They are basically designed for the Air conditioning in larger buildings, i.e. hotels, offices, hospitals, military complexes, etc. or for process cooling in various industries. This decision is often associated with a higher investment cost solutions than split-system air-conditioning or less per unit for each object in the cooling demand in the industry. In many cases, small non-hmm RAC units can be installed gradually and often by tenants, thereby eliminating the need for the owner to invest in and charge expenses tenants. Central systems with chillers are often preferred for larger systems, where opportunities for a more stable work load balancing cooling over time (as load simultaneously throughout the building), reducing maintenance cost are preferred, because it also avoids the noise and/or aesthetic problems, having a large number of split/unitary systems. This option is frequently used in large plants, operated by the owners with the ability to invest in longer-term solutions. Refrigerators, used in the world, Central air-conditioning systems, where R-22 is one of the most commonly used refrigerants, except CFCs are still present in large quantities in the old chiller equipment in both developed and developing countries. In addition to their use for air conditioning sector, chillers HCFC R-22 are also frequently used in the food and processing industry, and also in other industries, where processes require cooling. At one point, a large chiller segment using R-11 was to some extent converted to R-123, which is HCFCs, but has a low ODP and low GWP. At the time this report was written, there were no known alternatives R-123 suitable for the existing systems. R-245fa HFC alternative that can be used in low-pressure hmm applications, but has higher pressure, making it inaccessible for the majority of existing systems. Current information can be expected that this sector of the existing systems using R-123 will be supported leaks until the end of their life. 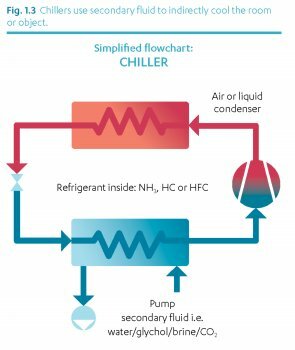 In most developing countries the introduction ofR-123 has been limited, although in some markets, a low pressure of R-123 chillers can be a segment that will require special attention in connection with problems, to replace it. As there are only few providers that make R-123 chillers, six, according to James M. Calm (James M. Calm, 2002), will determine how many units of this system are in operation, where they were installed, contact the manufacturers/importers. Indirect systems allow more freely find refrigeration plants with toxic or flammable refrigerant, chillers using hydrocarbons, ammonia, and refrigerants, are becoming increasingly common.